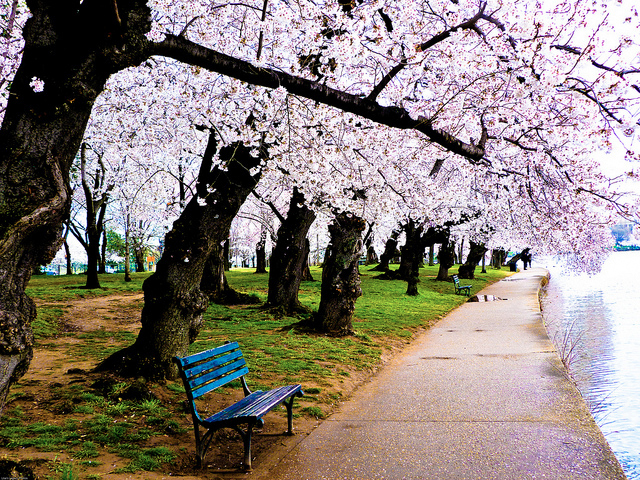 The time of day you’re photographing cherry blossoms determines the best place to photograph them. Many serious photographers arrive at dawn to avoid crowds and get that sunrise shot. The best spot is along the Tidal Basin by 15th St. SW and Independence Ave. SW across from the Holocaust Museum. The sun will be behind you and cast a glow on the water with the Thomas Jefferson Memorial as a backdrop. If you’re coming more around 7 p.m. for sunset, go to the Martin Luther King, Jr. Memorial at Independence Ave. SW and West Basin Dr. SW. The sun will be behind you near the Lincoln Memorial so you can shoot eastward with the Thomas Jefferson Memorial or the Washington Monument as backdrops. Any time of day, you can photograph around the King Memorial. It’s a good entrance way into the Tidal Basin and the oldest 50 trees that were part of the 1913 planting still remain to the left of King as you near the water. You can tell by their large girth. This is a good place to photograph King through the blossoms. There are isolated pockets of cherry blossom trees throughout Washington, but you can’t beat the Tidal Basin when it’s in full bloom. This entry was posted in Washington life and tagged Best Washington DC walking tours, Photo by Lisa Snider, Photographing cherry blossoms, Washington DC. Bookmark the permalink.